In 1818 novelist Mary Shelley penned a novel that would go on to become a classic. In her novel Shelley writes about a mad scientist who, in his attempt at scientific brilliance, recreates life. However, in doing so, the scientist inadvertently creates a monster that ultimately turns bitter and sets out to wreak havoc on his creator. While Frankenstein is fictional, how often do we find ourselves fighting real monsters that we create in the workplace? A failed initiative, a lackluster product, or as we often see, a confusing leadership development initiative that doesn’t provide results. Rather than developing outstanding leaders, this initiative leaves people feeling cold and frustrated. So, how do you know if your leadership development initiative is morphing into a monster? One important test is to insure that you are helping leaders to acquire the most important skills. Over the years, we’ve seen programs that focus on hundreds of different skills. We’ve seen programs on learning to become intuitive, how to improve your memory and others on improving table manners. While these are some of the more questionable topics we have observed, surely not all topics are created equal. We’ve discovered an interesting fact. The ability to inspire and motivate others to high performance is the single most important competency that a leader can possess. Yet, studies show that relatively few leaders possess this competency at a high level. What’s more, we don’t see many organizations attempting to help their leaders acquire it. Just as Frankenstein lacked any moral compass, such programs fail to instill one of the most important qualities that leaders need to possess. You might then ask the question; does the ability to inspire and motivate others really make that much of a difference? Our research says that it definitively does. In a recent study, we compared the frequency of employees’ thinking about quitting their jobs with the degree to which they felt their leader was inspiring and motivating. The vertical axis plots the percent of employees thinking about quitting and the horizontal axis shows a leader’s ability to inspire and motivate. The comparison is startling; 30% of employees working for a leader that was average (36-65 percentile) thought about quitting. We’re not even talking about the worst leaders; we’re talking about average leaders. The employees thinking about quitting (the ones working for an average leader) were nearly double those that worked for a leader who was in the top ten percentile of inspiring and motivating. 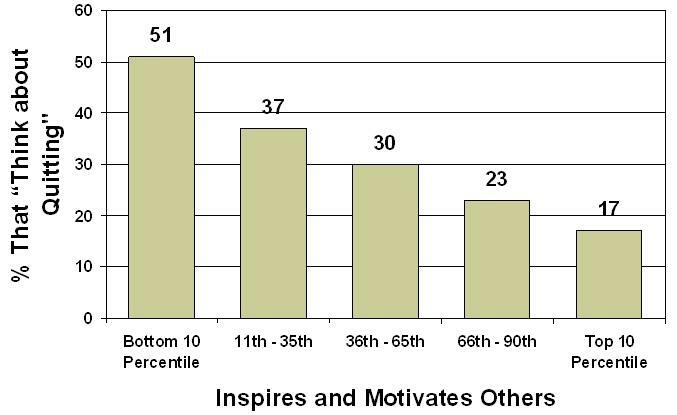 Three times as many people reporting to a leader in the bottom 10% think about leaving in comparison to those reporting to a top 10% leader on the dimension of inspiring and motivating. The dollar costs are huge. The costs involved in losing an employee and then recruiting, hiring, and training a new employee are huge. Organizations can’t afford to lose top talent simply because their leader is poor or even average. In short, organizations need leaders who inspire and motivate others to high performance in order to succeed. So, how do you approach this question? Much of what is required to become an incredibly inspiring leader depends on your leadership approach. The late Andrall Pearson, former Chairman of Tricon (later known as YUM), spent the first part of his management career leading through fear, toughness, a focus on numbers and abrasiveness. After joining YUM Brands he discovered that the company’s culture, and much of its success, was due to a leadership style built not on firm, abrasive toughness or a strict focus on numbers, but rather, on recognition, rewards, listening and appreciation. Pearson changed his leadership style from hard-nosed to a more balanced approach. By developing better communication and interpersonal skills, his drive for positive numbers became a quality his employees admired rather than feared. Ultimately, as people saw that he was willing to speak and interact with them rather than at them, his employees worked harder, were more productive and drove higher profits. Just as the 1990’s slogan for Reese’s candy was “There's no wrong way to eat a Reese's,” we emphasize that there are multiple styles or approaches that leaders can employ, that enable them to be inspiring. The leader that pushes for great numbers can learn something by developing better skills with people. In contrast, the leader who is excellent at dealing with people will be more inspiring if she will use the relationships she’s developed to get people to reach for and achieve higher and more challenging outcomes. Developing skills in any one of the 6 approaches outlined above will help leaders connect to people who may respond better to one approach over another. Think about the approach you respond best to. Notice how others respond to certain approaches and to your own preferred leadership approach. By varying your approaches, you’ll have a much greater inspirational impact and be perceived as a much more inspiring leader.